Hassle Free Lawn Care in Des Peres MO, Just a Phone Call Away! Lawn care. Des Peres MO folks not only know a lot about it, but are also some of the most responsible and wise property owners in the area. How so? Just take a long walk through Des Peres and you will see lush, thriving lawns, exquisitely designed landscapes and front yards, green shrubs, well-trimmed trees and patches of colorful, healthy flowers. Des Peres lawns are the kind they call ‘the envy of the entire neighborhood’. How do they enjoy such amazing outdoor properties? Most of them know that, for optimal lawn care results, it’s best to call in the experts, to completely design, remodel or maintain their small patches of paradise. And we, at Lawn Masters, know all about these things because we have been providing lawn care and maintenance services in the area for more many years. Our goal has always been to offer our clients hassle-free lawn care at affordable prices. We always make sure to respect the owners’ needs, priorities and wishes. This is why nowadays our range of services includes almost anything one can think of, from basic lawn mowing and seasonal leaf clean-ups to more complex projects, such as landscape remodeling, irrigation installation and repairs. 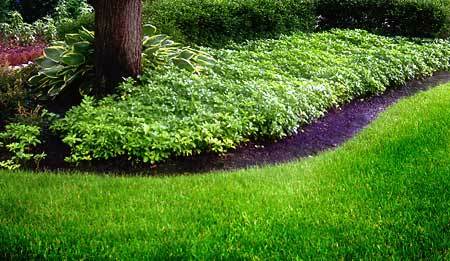 We also provide fertilization and weed control, in accordance with current environmental protection principles. If you live in Des Peres MO, lawn care will never be a problem again! One of our biggest accomplishments is that we have always taken a keen interest in training our staff. Our certified professionals guarantee the best results. They won’t apply techniques they learned ten years ago to your lawn and landscape, as we are constantly preoccupied with their training. They are always up-to-speed with the latest information and technologies in the field. If you need high-quality lawn care, all you have to do is give us a call. Our price quotes are honest and straightforward. Our staff will only start working on a lawn care project after you are sure it meets your needs and wishes. We never put in any lawn care work without your approval. This is our “business card” and we treat all our customers like this, no matter how small or large their projects are. After we all agree on what is best for your lawn and landscape, you can sit back and relax, while we do our job with maximum efficiency. You can opt for mulching and aeration, flower planting and flower bed maintenance, drainage installation and repair, tree, shrub and hedge trimming and maintenance, fertilization and weed control (implemented with care and respect for the environment.) All you will have to do at the end of the day is to relax in your paradise-like garden, without having made any effort and without having paid a fortune for this pleasure. We always answer our clients’ calls and offer honest quotes, deadlines and information. We can come up with a plan that best suits your needs, your budget and your future plans for the property. We will make sure to deliver everything we promise and then some! Call us today and find out for yourself!